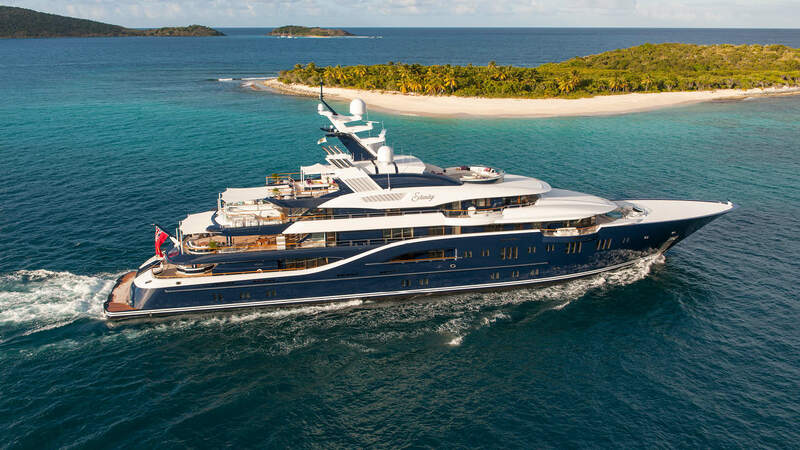 The stunning 85,1m superyacht SOLANDGE is one of the finest vessels currently available for charter and is one of the world’s largest and most iconic yachts. The gorgeous interior for SOLANDGE is the result of collaboration between Rodriguez Interiors and Dolker & Voges with using about 50 different marble and granite surfaces and more than 30 alternative woods. Charter guests aboard are greeted by the vast elegant main saloon, boasting two magnificent walls of back-lit amethyst, which is the first thing to notice and feel. The interior of the ultra-luxurious yacht SOLANDGE exudes elegance, luxury and opulence, as you walk through the beautiful wooden floors with borders of honey onyx stone and gold leaf ceilings with Schonbeck chandeliers dripping with amethyst rose quartz crystals. Motor yacht SOLANDGE sleeps 12 guests in eight exceptional staterooms and has a large individualised owners’ deck and suite. Additional guest rooms include a VIP suite which can be converted into two spacious cabins and a further two doubles and two twin cabins. SOLANDGE is easily able to accommodate a large gathering of guests for entertainment and parties as well as sleeping overnight in ensuite cabins in style and comfort. The vessel’s numerous crew of 29 sleep in 15 crew cabins. In addition to state-of-the-art audio visual and communication systems on board, SOLANDGE also features an ultra-modern zero speed stabilization system which reduces roll motion effect and results in a smoother more enjoyable cruising experience. With a cruising speed of 14 knots, a maximum speed of 18 knots and a range of 6,000 nm from her 220,000 litre fuel tanks, SOLANDGE is the perfect combination of performance and luxury.